An Australian Open semi-final rematch is all set between the world number one, Serena Williams and soon-to-be world number two, Agnieszka Radwanska at the 2016 BNP Paribas Open on Friday. In a draw that initially began with 16 of the 32 seeds falling in the second round, the two highest seeds have emerged from the top half. Indian Wells has been a really fun tournament for the women; there’s been a nice balance between top ten players delivering and new names taking advantage of opportunities with players such as Daria Kasatkina making waves in the desert. Radwanska was first into the semi-finals with a 6-2 7-6(3) victory over Petra Kvitova; the number three seed, Radwanska, came back from *2-5 down in the second set to secure her second consecutive win over Kvitova. The performance wasn’t as glitzy as some of her previous displays, but it was solid enough and got the job done against an erratic, Kvitova. The Czech player produced 22 unforced errors in a wayward opening set. Kvitova settled down at the start of the second set, saving two break points with a confidence-boosting first hold of serve. At the second time of asking, Kvitova consolidated a break of serve to lead 5-2, taking advantage of some rare errors from Radwanska. Radwanska battled back in the second set with three straight games, securing the break back with a wonderful drop shot-lob combo (see tweet below). The tiebreak was all Radwanska as the net, clearly Polish, saw three clips of the net all go the way of the number three seed. Radwanska’s ability to mix up the play with slices and drop shots was a key factor in this match, contributing to Kvitova’s hefty tally of 41 unforced errors. Kvitova’s never done much through the Indian Wells-Miami swing so this was a very positive result, particularly as she was defending no ranking points. Serena produced an excellent performance to take out the number five seed and defending champion, Simona Halep, 6-4 6-3 in Thursday’s late night match. It was a decent match and an encouraging display from Halep after a miserable start to the year. The Romanian player, cheered on by her many fans in the stadium, went up an early break with Serena producing a trio of errors long. The world number one responded immediately with an aggressive game including two return winners. Serena had great success at dragging Halep out wide with the serve, and also pushing her back behind the baseline with her depth and weight of shot. The key moment in the first set was the sixth game with Serena up 3-2; Halep had a game point but netted a forehand and would eventually be broken. While Halep prolonged the set by breaking Serena as she served for the set, the Romanian player was unable to hold serve under the barrage of pressure from the American. Halep stayed in contention at the start of the second set but one loose service game, the sixth game again, and that was it. Serena didn’t flinch, serving out the victory with her seventh ace of the match. Head-to-head record: Serena leads Aga, 9-0 in the head-to-head. While Radwanska did record a win in exhibition action at the Hopman Cup last year, she’s never really come close to a win on the WTA tour. Radwanska’s only set in those nine encounters came in the Wimbledon final back in 2012. In their most recent match, Serena won in the semi-finals at the Australian Open, 6-0 6-4, playing a near-perfect first set. March 17, 2016 in Indian Wells, Radwanska, Serena, WTA. I agree James that the odds of Aga winning this match appear to be long ones, but just for the heck of it if nothing else let’s try and look on the bright side and see what Aga might be able to do to turn this around. We know that Aga’s dead set on winning this tournament – she’s said so more than once recently – and she knows that she has to get past Serena to do it. So, it’s a fair bet that she has a plan, and being an obviously intelligent person it will be an intelligent one. My guess it is something like this; she’ll be looking at the players who have beaten Serena, such as Alize Cornet (who has beaten her three times), Belinda Bencic, Jana Cepelova and (of course) Roberta Vinci and tried to find out what, if anything, they had in common. I’d draw the line at Sabine (Lisicki), who beat Serena in 2013 at Wimbledon, because she can hit a lot harder than Aga can: and Petra (who beat her in 2015 at Madrid) and Angie Kerber being southpaws their styles wouldn’t be something Aga could emulate; but that still leaves us several. Then I’d try to work out some kind of a plan. I’d particularly be looking at how Alize went about playing her, as three times in a row has to be an achievement worthy of respect. After all, no one thought Roberta Vinci had a prayer of beating Serena at the US Open last year … until it happened. As Ozzy Osbourne once sang, never say die! In the Aussie final, one positve Kerber had was she had beaten Serena before. In the grand scheme of their match-ups, it may not have seemed like much. But, in that high pressure final, it was probably a soothing comfort to Kerber psychologically. Radwanska has to break a cycle here. Of the players you mention, Alize Cornet should be her mental study because she is one of the few with a back to back win. I’m not optimistic, yet, I’m hopeful that Radwanska can use this opportunity to build herself up mentally for tournaments up ahead. I feel even beating Serena in this semi-final is more of a strategic win going forward. At this point, the odds are not in her favour. Serena tops her in all departments save for ‘outrageous gets’. She’s been playing her good tennis so wishing her the best. None of those women beat an in form Serena. Maybe Vinci, but Serena 100% choked in that match. Serena had a bad back in Doha, she retired from the match in Asia and she was sick at Wimbledon. If you mention Gabine at the French Open then I would agree with you. She played terrible against Vinci and Kerber. I guess the pressure caught up to her and she made 100 unforced errors. If Aga catches her of guard like Gabine then she has a chance. Aga does have some good drop shots in her game. But, Serena is already aware of how good of a player she is. Serena knows she needs to be ready – I can already sense that she wants to win the title in Indian Wells. 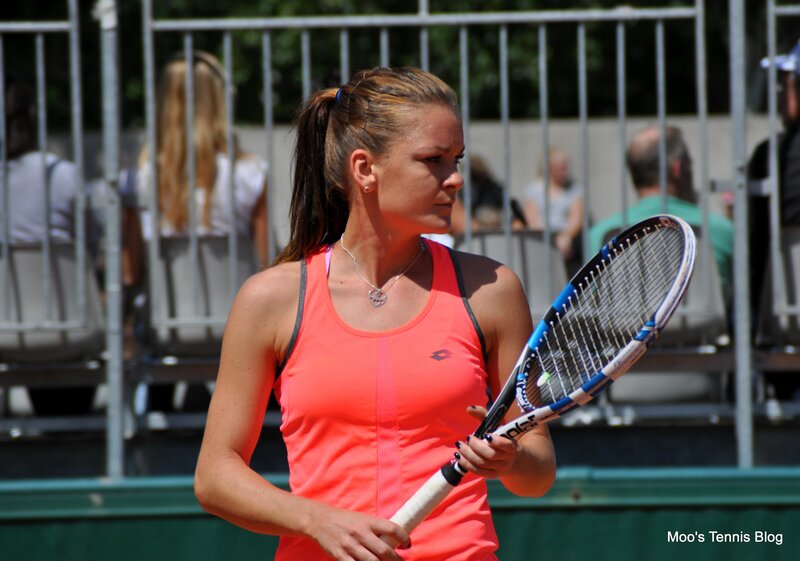 I feel that Aga will put up a good fight against Serena. But, Serena’s the only player to have not dropped a set in the tournament in the women’s draw and her serve is a strong weapon, which Aga doesn’t even have. I predict that Serena will take this match in two sets. Without any doubt, Serena will win this easy match in 2. What is wrong with Petra? She doesn’t play with the passion as Serena, Aga, or Vika. And Petra has the game to be Number 2 or 3. I think she will fall out of te the top 10 soon. Vika and Aga are ready to step up and take Serena’s place when she leaves. Well Petra just reached the quarter-finals in Indian Wells so I think she’s getting there! She will always be up and down by the nature of her game. She had that stomach bug at the start of the year and I wonder if she was 100% over the mono. Also, splitting with her coach was probably a big deal since they’d be together for so long. I don’t know either. I wonder if the mono’s still affecting her. I think their individual personalities plays a part in how motivated(drive) they are too. I simply yearn for a period when these women are all healthy and playing their best game. The ranking in and of itself is just a numbers game to me. I wish the match between the no. 4 and and the No.8 players to be as competitive as that between the No.1 and No.2 or the No.1 and the No.9 ranked player. Imagine the match between say Serena and Lisicki being as competitive as that against a Vinci, a Pliskova, an Azarenka, a Kvitova or even a Kerber. Varying styles, but you know they all pose a great challenge playing their best game. Ha,is that too much to ask?! I just want good tennis matches. The WTA website said that Aga will push Serena to three sets. But, I find that impossibly impossible to believe, especially with the way Serena’s been playing so far this year. Scoreline will probably be 6-3 6-0, 6-1 6-2, 6-1 6-1, 6-4 7-5, 6-3 7-5, or 6-3 6-4 in Serena’s favor. Serena is by FAR…Thee BEST to ever play the sport! From the highlights it looked like Aga played a really good match and had a break up in both sets at one point. But Serena was pretty ruthless at times. I havent seen her that fired up in a while. The question now is whether she’ll play Miami or skip it? If she loses to Vika I think she’ll probably play and retire midway through. If she wins then im not sure. Miami is pretty much Serena’s home tournament; she lives just a few miles from there in Florida, the crowds there always support her and she’s won it something like eight times now. Of all the ones in the calendar, it’s the one I’d be the most surprised to see her not play in.